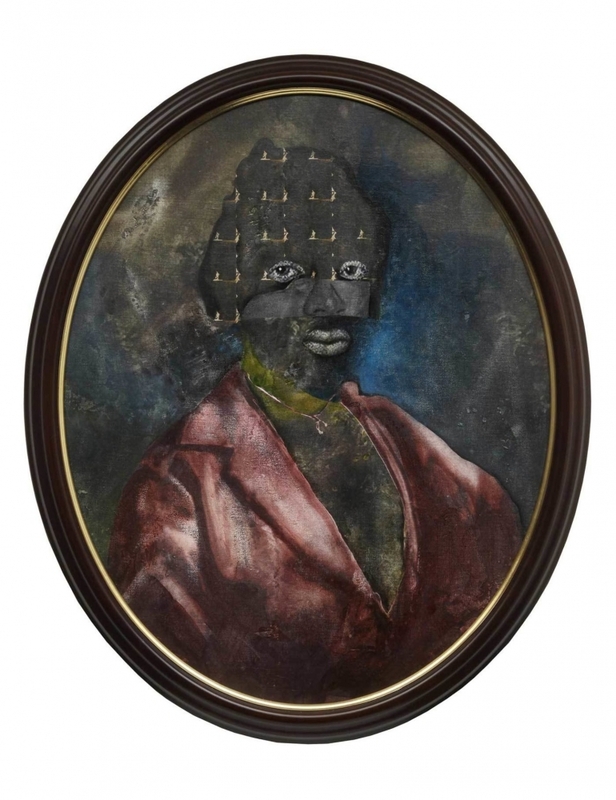 The artist talks about claiming noble lineages through hybridized portrait paintings. Portrait paintings were once a sign of wealthy families’ noble lineage. The characters that inhabit my work respond to that elitism and reclaim their own noble lineage. Their bodies, both dignified and regal, exist to move freely through space—they are not fixed to spatial and temporal boundaries. Throughout my painting process, I often put myself in place of the viewer. I see this portrait as a portal that provides a glimpse and fleeting moment into a potential future and deep cosmos. There’s a suggestion of a journey, and the destination is uncertain for the subject as well as the viewer. The viewer is confronted by the gaze of a hybridized figure—a traveler, a face fractured and obscured. Is he moving through space or are we looking at a reflection of ourselves? There’s a push and pull in assembling to see how much I can remove from the character’s features while still having him communicate a sense of power, freedom, and command of the space. I leave visible only fragments of the face to see whether the figure can still exert an aesthetic force that has a presence of its own without the triggers ordinarily used to identify power. Through gesture and playfulness, I excavate history and reimage ancient sources into the future. The portrait becomes renewed with personal narratives broken and revised, suggesting the fracturing and complexities of human experience. It reminds us we are still on a complex journey trying to navigate our way in search of freedoms. David Shrobe: Somewhere In Between is on view at Jenkins Johnson in San Francisco until October 27. David Shrobe is a New York-based visual artist who was born and lives in New York City. He holds an MFA and a BFA in painting from Hunter College. He is an alumnus of the Skowhegan School of Painting and Sculpture. His work was recently included in Uptown, the Wallach Art Gallery Triennial at the Lenfest Center of the Arts, New York, NY; Harlem Postcards at the Studio Museum in Harlem; and in Bronx Calling: the Fourth AIM Biennial, at the Bronx Museum. He has had solo exhibitions at Thierry Goldberg New York and Miami, The Sugar Hill Children’s Museum in Harlem, and at Russ Berrie Pavilion in New York. David Shrobe, Celestial Pose, 2018. Acrylic and ink on canvas. 34 x 27 inches. Image courtesy of the artist and Jenkins Johnson Gallery.